In: Science. 351(6279): aac4750. doi: 10.1126/science.aac4750. In: Science. 346(6205): 71-5. doi: 10.1126/science.1257859. In: Science. 346(6213): 1146. doi: 10.1126/science.346.6213.1146. In: Science. 338(6110): 1039-40. doi: 10.1126/science.1224310. In: Science. 318(5853): 1121-5. doi: 10.1126/science.1148532. Description / Table of Contents: Substantially revising and updating the classic reference in the field, this handbook offers a valuable overview and myriad details on current chemical processes, products, and practices. No other source offers as much data on the chemistry, engineering, economics, and infrastructure of the industry. The Handbook serves a spectrum of individuals, from those who are directly involved in the chemical industry to others in related industries and activities. It provides not only the underlying science and technology for important industry sectors, but also broad coverage of critical supporting topics. 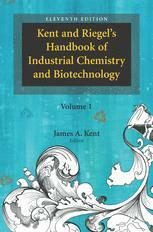 Industrial processes and products can be much enhanced through observing the tenets and applying the methodologies found in chapters on Green Engineering and Chemistry (specifically, biomass conversion), Practical Catalysis, and Environmental Measurements; as well as expanded treatment of Safety, chemistry plant security, and Emergency Preparedness. Understanding these factors allows them to be part of the total process and helps achieve optimum results in, for example, process development, review, and modification. Important topics in the energy field, namely nuclear, coal, natural gas, and petroleum, are covered in individual chapters. Other new chapters include energy conversion, energy storage, emerging nanoscience and technology. Updated sections include more material on biomass conversion, as well as three chapters covering biotechnology topics, namely, Industrial Biotechnology, Industrial Enzymes, and Industrial Production of Therapeutic Proteins. Notes: Recent guidelines released by the U.S. EPA define a worst-case scenario as a release under stable atmospheric conditions defined as Pasquil-Gifford stability class F. Unfortunately, very few tests at F stability have been available heretofore to provide a basis for models. Recent test data with propane releases by the German research organization TUV provide a set of 60 experiments conducted specifically to define the effects of atmospheric stability class on dispersion. Of these, 25 tests were at F stability. A comparable number were at each other stability class A through E. In addition 23 tests were at wind speeds under 1.5 m/s in stable atmospheres. This paper reports on adjustments made to our models based on these new data by reducing the originally-postulated sensitivity to stability class. In spite of considerable scatter in the TUV data, particularly between two different types of propane analyzers, the model allows us to extract information by averaging over the tests. Senecal, Joseph A. ; Beaulieu, Patricia A. Notes: The design and deflagration pressure relief vents is based on correlations developed for various types of combustible materials and for enclosures of different strengths. The primary guideline for deflagration vent design in the US is NFPA 68 Guide for Venting of Deflagrations . That document gives guidance for the design of vents for enclosures containing flammable gases, specifically hydrogen, coke oven gas, propane, and methane. Application of the guide to other gases is achieved using the KG value. Values of KG are published for a relatively small number of gases, as seen in Table D-1 of NFPA 68. This work present KG data on several additional gases obtained in a laboratory scale test vessel along with analysis of the results with respect to published values of fundamental burning velocity. Notes: In May 1996, the Flammable and Combustible Liquids Code Committee of the National Fire Protection Association (NFPA) proposed for adoption by the Association a new edition of NFPA 30, Flammable and Combustible Liquids Code. This new edition was the culmination of two and one-half years' work by the Committee and included one of the most significant changes to that document in some twenty years: the incorporation of mandatory fire protection criteria for warehouses and other inside areas that store flammable and combustible liquids in containers and portable tanks. Notes: A multi-disciplinary team developed a guideline for determining access restriction zones around vented solids handling equipment. The guideline provides a method for ensuring the discharge from a vented explosion will not cause injury to personnel. The steps in this method include: calculating the extent of external hazards from vented explosions; identifying potential areas where personnel could be exposed to a hazard; identifying ways to eliminate or reduce the hazard area; and establishing and documenting any access restrictions needed. Hazard zone calculations use the latest knowledge from research into fireball size, flame length and external pressure equations in VDI 3673. The guideline provides guidance for using this information. Options for mitigating or reducing external hazards from vented explosions are also described. As part of the project, the team audited several solids handling systems to look for potential oversights in existing restricted access areas. Some of the team's learnings from these audits are reviewed. Notes: This paper describes the development of a risk ranked Inspection Recommendation procedure that is used by one of Exxon's chemical plants to prioritize repairs that have been identified during equipment inspection.As part of the Company's Safety Management Practices initiative in the late 1980's a procedure was put into place to ensure that an Inspector's repair recommendations were properly addressed by the organization. The initial procedures were successful at “systematizing” the documentation and stewardship-to-completion of the Inspector's recommendation, however, there were complications with the original process: (1)The Inspector made a simple High, Medium or Low assessment of the priority/criticality of the recommendation. Frequently, this resulted in disagreements with Operations about the true priority of the recommendation. (2)If there was agreement on the priority of the recommendation, there was still disagreement on the relative rank within the priority-which high priority was the highest priority? (3)With limited funds to spend on repairs, it was (and is) important to make sure that the money was being spent on the highest risk items that had the greatest risk reduction/cost benefit ratio.To address these concerns, the procedure was modified to incorporate a risk assessment of the recommendation by both the Inspector and Operations. In the new procedure, the Inspector describes the deficiency that he/she finds and assesses the probability of failure within a certain time-frame. Operations must assess the consequences, from an environmental, safety and economics standpoint, were the failure to occur. These assessments are combined in the typical risk equation (risk = probability × consequences) to arrive at a severity index which serves to rank the recommendation relative to the other recommendations. Because Operations participates in the assessment there is very little disagreement about the priority of the recommendation. The severity index puts the recommendations in order so it is quite clear which are the highest priority recommendations. This process has helped to focus the entire organization on those deficiencies that represent the greatest risk with the result that less time and money is spent correcting items that have a low risk/cost benefit ratio, allowing these savings to be used to reduce the higher risks in the plant. Notes: Most audits try to look at a representative selection of the plant procedures and equipment. An alternative is a survey, a look in depth at selected procedures (such as those for testing alarms and trips, issuing permits-to-work, controlling modifications, taking samples or testing relief devices) or selected equipment (such as level glasses or equipment for handling LPG). If the procedure or equipment is well-chosen, surveys may make a bigger contribution to safety, per person-hour, than a conventional audit. Notes: Under OSHA 1910.119, all Process Safety Management (PSM) facilities are required to keep their pressure relief system design information current. This article demonstrates why a pressure relief system design verification effort must be based on an equipment list, rather than a relief device list, in order to ensure that every piece of equipment is adequately protected. The formerly common practice of simply checking the design bases of all existing relief devices is deficient is deficient since this technique does not systematically ensure that every piece of equipment is protected.The “Berwanger Method” is a step by step process for designing or analyzing a pressure relief system to meet OSHA 1910.119 Process Safety Information (PSI) and Process Hazard Analysis (PHA) mandates. The method uses a relational database which tracks the relationships between protected equipment, potential overpressure scenarios, and protective devices.The challenge facing an operating company does not end once the design basis has been “verified” - the design basis information must also be maintained and be readily accessible to avoid costly reinvention of the wheel down the road. The “Berwanger Method” also addresses these maintenance issues. Kaber, David B. ; Endsley, Mica R.
Notes: This paper defines situation awareness (SA) and discusses its importance to operator-machine system safety and functioning in the context of process control activities. Specifically, identified are relationships of human detection of critical process cues converying the status of automated control systems and operator interpretation of the meaning and relevance of such information to the potential for negative incidents in chemical processing. Beyond individual operator SA in interacting with control systems, intra- and inter- work team SA are discussed for supporting individual attainment of process control responsibilities. Factors critical to team SA are discussed. “Road blocks” to team SA are also analytically examined. Lastly, methods for assessing individual and team SA are reviewed and vehicles for relating outcomes of these methods to changes in process control operator and team behavior to improve human-machine system safety and performance are relayed. Notes: Risk assessments have been performed to determine the risk associated with the transportation of hazardous wastes through a city. In the course of these assessments, a number of modeling issues arose relating to transportation accident rates, the characterization of incidents, the effect of thermal radiation, the impact of exposure to toxic chemicals, and the threshold for acceptable risk. This paper discusses these issues. Melhem, G. A. ; Reid, D.
Notes: This paper reports on a comprehensive literature search and small scale experimental work on the reaction characteristics of phosphorous trichloride and water. More than 30 tests were conducted, including both closed and open test cells. The water to phosphorus trichloride molar ratio was varied from 1 to 25. When in contact, water and phosphorus trichloride will form two liquid layers with a reaction starting at the interface. The impact of variables on reaction rates including the interface surface area, layer depth, and stirring were investigated experimentally. A reaction rate model that fits all the measured data is presented. Case studies illustrating the use of this data for emergency relief systems and vent containment design are presented in reference. .
Notes: Two major accidents in the 80's: the summit Tunnel Fire, England and Piper Alpha disaster, an offshore platform in the North Sea; and very recently, possible explosion of the Boeing, TWA flight 800 at New York, makes it imperative that further research into the mechonisms of the ignition of flammable vapor/air mixture in contact with hot surfaces needs to be done. There have been a number of studies of ignition by hot surfaces, but in all these studies the ignition sources were wire, sphere or strip, i.e., most of them were flat surfaces. But to the authors' knowledge, other variables which affect the ignition mechanism such as irregular geometrical shapes have not been studied. The purpose of this paper is to examine how the degree of confinement (or, configuration), size and orientation, of the heated surface affects the ignition temperature of the flammable vapors. The results were obtained by experimentnal and by computational fluid dynamics. Notes: The knowledge of the ingition behavior of dust-air mixtures due to electrical sparks (MIE, Minimum Ignition Energy) and hot surfaces (MIT, Minimum Ignition Temperature) is important for risk assessments in chemical production plants. The ignition behavior determines the extent and hence the cost of preventive protection measures.This paper describes the use of the minimum ignition energy and minimum ignition temperature as very important safety indexes in practice.Based on the latest results from large scale experiments on pneumatic filling of silos with polymeric materials and new results of full scale filling tests using Flexible Intermediate Bulk Containers (FIBC) manufactured from a variety of materials, guidance can be given to ensure safe operation in different situations such as filling, emptying operations, type of powder handled.The aim of this paper is to assist people dealing with product. It reflects the present state of the art and current knowledge of the assessment and measures associated with powder handling. Notes: Regulatory issues related to material safety have made the accurate measurement and/or prediction of flash points essential. The flash point is one of the major physical properties used to determine the fire and explosion hazards of a liquid. Flash points are used by virtually all governmental entities worldwide to define “flammable” and “combustible” materials for shipping and safety regulations.A model is described here for the calculation of closed cup flash points for multicomponent, single liquid phase, mixtures. The model is based upon rigorous vapor/liquid equilibrium calculations supplemented with information about the lower flammable limits (LFL's) and heats of combustion (ΔHc's) for the mixture's constituent components. The closed cup flash points predicted with this model are typically within ± 5°C of the experimentally reported values. Such a model is useful as a means of verifying experimental data and as a tool for screening product formulations prior to experimental flash point determination. The model should considerably enhance the safety evaluation portion of the product development cycle, thus leading to shortened product time-to-market cycles. While flash points calculated with this model are in excellent agreement with experiment, experimental determination is still encouraged for critìcal safety applications. Notes: This paper presents the design of ribbon wound pressure vessels useful for Ammonia, Urea and Methanol plants. The design is to create a thin shell of 1/5 the total wall thickness required, weld it to the end pieces, and wind 4 to 8 mm thick ribbons of 80 mm width at an angle of 15 to 30 degrees on the inner shell, using a prestress. The ribbons are welded at the ends and an even number of layers are wound cross-helically on to the shell. With more than 7000 vessels over the pressure range of 50 to 350 atmospheres in use in the various chemical industries in China over the past 30 years, their safety record has been excellent. Of particular interest has been the application of this technology in the Ammonia and Urea plants, where the design allows fabrication of these vessels at substantial reduction in cost, and early delivery, when compared to the mono wall technology. Bradford, William J. ; Davenport, John A. ; Schwab, Richard F.
Notes: Safety, health and loss prevention are major areas of interst for the American Institute of Chemical Engineers (AIChE). There has been an evolution of these concerns over the years in the Institute just as it has in industry. This article chronicles this evolution. Notes: In mid-1997, an Advanced Process Control (APC) scheme was implemented at a resins manufacturing complex with the goal of minimizing flare fuel gas usage while maintaining sufficient energy (BTU/SCF flare gas) to be in environmental regulatory compliance. Prior to APC implementation, the flare system was manually controlled by plant operators with minor attention paid to the minimization of fuel gas usage. Since implementation, APC has saved the plant thousands of dollars in fuel gas costs and reduced unnecessary combusted fuel gas emissions.Hazard analysis techniques were used in the development of the control scheme. An overview of the APC used, the economic evaluation, and the hazard analysis techniques used in the project are presented here. Khan, Faisal I. ; Abbasi, S. A. Notes: In the risk assessment parlance, especially with reference to chemical process industries, the term “domino effect” is used to denote “chain of accidents,” or situations when a fire/explosion/missile/toxic load generated by an accident in one unit in an industry causes secondary and higher order accidents in other units. The multi-accident catastrophe which occurred in a refinery at Vishakhapatnam, India, on September 14, 1997, claiming 60 lives and causing damages to property worth over Rs 600 million, is the most recent example of the damage potential of domino effect.But, even as the domino effect has been documented since 1947, very little attention has been paid towards modeling this phenomena. In this paper we have provided a conceptual framework based on sets of appropriate models to forecast domino effects, and assess their likely magnitudes and adverse impacts, while conducting risk assessment in a chemical process industry. The utilizability of the framework has been illustrated with a case study. Notes: A simple analytical method is presented for estimating the hybrid minimum ignition energy (HMIE) of dust-gas mixtures, based on the assumed generality of Bartknecht's well-known test data for mixtures of propane with a series of dusts in air. Since the HMIE equation requires input data which might be unavailable, the use of conservative default methods is discussed. Notes: The Baker-Strehlow methodology was developed to provide an objective approach to prediction of blast pressures from vapor cloud explosions. The complete methodology was first published in 1994 . Since then, it has evolved through ongoing research and use in VCE hazard analyses, facility siting studies and accident investigations. This article gives a brief overview of a paper on recent developments in the Baker-Strehlow methodology presented at the 31st Loss Prevention Symposium in Houston on March 9-13, 1997. Because the entire paper is too lengthy to be presented here, the following discussions may be lacking in some details. A copy of the complete paper can be obtained from the American Institute of Chemical Engineers (AIChE).Since the Baker-Strehlow method was first published, it has been used extensively in VCE hazard assessments in refineries and chemical plants. As expected, many practical lessons have been learned during the course of the hazard assessments, and the Baker-Strehlow method has evolved as a result. The changes have been evolutionary, not revolutionary. In keeping with the goals of the original study in which the methodology was developed, all changes have been incorporated with the intent of achieving an objective methodology to provide consistent prediction of VCE blast effects.The revisions to the Baker-Strehlow method resulting from experience gained during plant walk-downs and hazard assessments include: Systematic identification of “potential explosion sites” or “PESs,”Selection of the level of confinement for mixed zones of 2D and 3D confinement,Deciding on flame expansion when confinement is elevated above the vapor cloud,Selecting the reactivity for a fuel that is a mixture of fuels with differing reactivities,Predicting blast loads when there are multiple PES's within a vapor cloud considering different ignition source locations. Notes: From the 1960s onwards, the chemical and oil industries developed and used a number of new safety techniques which, in time, became second nature to those who applied them. They included the use of QRA for deciding priorities, Hazop and audits for identifying problems, inherently safer design for avoiding hazards, and more thorough investigation of incidents for identifying underlying causes. However, it has not yet become second nature to remember the accidents of the past and the actions needed to prevent them happening again.I joined industry in 1944 and moved to production in 1952. Then, and for at least 15 years afterwards, safety was a non-technical subject that could be left to arts graduates and elderly foremen. There was concern that people should not be hurt - great attention was paid to the lost-time accident rate - but there was no realization, that it was a subject worthy of systematic study by experienced technologists.This view changed at the end of the 1960s. A new generation of plants had been built, operating at higher temperatures and pressures and containing larger inventories of hazardous chemicals; the result was a series of fires and explosions and a worsening fatal accident rate. Figure 1 shows the situation in ICI, at the time the UK, s largest chemical company. Other companies experienced a similar state of affairs.As a result in 1968, I was appointed one of the company's first technical safety advisers, an unusual appointment at the time for someone with my experience, and if the reason for my appointment had not been so obvious I would have wondered what I had done wrong. I and my colleagues tried to apply the same sort of systematic thinking to safety that we applied in our other professional work. We developed some new concepts and techniques and adopted others. A common feature of our ides, realized only in restrospect, was that they consisted of more than mere problem-solving techniques. Once people had got used to these new concepts and used them a few times, they began to look at a whole range of problems in a different way. Notes: HFC-227ea (CF3CHFCF3;1, 1, 1, 2, 3, 3, 3-heptafluoropropane) is an effective replacement for Halon 1301 in fire suppression systems, providing rapid extinguishment of flames through a combination of physical and chemical mechanisms. The vast majority of applications for HFC-227ea involve the protection of Class A hazards, which are characterized by low fuel loadings and low energy output, with fire sizes often in the range of 5-10 kW. Mid- and large-scale testing has demonstrated that HFC-227ea, at its minimum design concentration of 7.0% v/v, is effective at extinguishing fires typical of those expected to occur in electronic data processing (EDP) facilities, telecommunication facilities and anechoic chambers. The levels of HF produced following extinguishment of typical Class a fires with HFC-227ea were well below the estimated mammalian LC50 and the human Dangerous Toxic Load (DTL), and do not appear to present a threat to electronic equipment. Woodward, John L. ; Woodward, Hillary Z. Notes: On October 31, 1987 a crane lifting a heat exchanger convection section failed and severed a 4″ loading line and a 2″ pressure relief line to an HF alkylation reactor settler drum at a petroleum refinery in Texas City, Texas. Vapors were emitted under pressure for about two hours and the vessel was plugged and drained aproximately 44 hours later. A plume from this accidental release passed through residential areas, damaging some vegetation (brown lawns), and spawning a class action law suit. An extensive analysis was conducted to determine the total inventory loss and to model the blowdown process and the concentrations of HF in the plume. Since the discharge rate was decreasing with time, a peak concentration of HF in the emitted vapors occurred just before the water spray mitigation system became fully operative. Consequently, the mitigation efforts were more effective late in the response when concentrations were already low. The predicted plume concentrations are consistent with observed vegetation damage effects, with concentrations below Emergency Response Planning Guideline Level 3 past 3/4 mile from the source. These results support a policy of sheltering in place during such an event. Antrim, Robert F. ; Bender, Michael T. ; Clark, Michael B. ; [et al.] Evers, Lee ; Hendershot, Dennis C. ; Magee, Joseph W. ; McGregor, Jane M. ; Morton, Paul C. ; Nelson, John G. ; Zeszotarski, Carol Q. Notes: A fifty-five gallon steel drum of a liquid organic peroxide pressurized and ruptured in the mix room of a manufacturing plant. The head of the drum blew off and the ejected material ignited. The resulting fire was extinguished by the building sprinkler system and operating personnel. Although there were no injuries, the fire caused significant damage in the mix room. The investigation of this incident, its likely cause, and the corrective actions will be discussed. Ekman, Mark E. ; Werner, Paul W. ; Covan, John M. ; [et al.] D'Antonio, Perry E.
Notes: Sandia National Laboratories (Sandia) has refined a process for developing inherently safer system designs based on methods used by Sandia to design detonation safety into nuclear weapons. The process was created when Sandia realized that standard engineering practices did not provide the level of safety assurance necessary for nuclear weapon operations, with their potential for catastrophic accidents. A systematic approach, which relies on mutually supportive design principles integrated through fundamental physical principles, was developed to ensure a predictably safe system response under a variety of operational and accident-based stesses. Robust, safe system designs result from this thematic approach to safety, minimizing the number of safety critical features. This safety assurance process has two profound benefits: the process avoids the need to understand or limit the ultimate intensity of off-normal environments and it avoids the requirement to analyze and test a large array of accident environment scenarios (e.g., directional threats, sequencing of environments, time races, etc) to demonstrate conformance to all safety requirements. Notes: A new method is described to enhance the management of process safety risks such that the number and type of safety systems protecting against any hazard are consistently predicated upon risk. Further, that such an assignment of safety systems can be made consistent throughout an organization. This consistency is gained through standardization of qualitative risk ranking and by setting company guidelines. Tamanini, Francesco ; Chaffee, Jeffrey L. ; Jambor, Richard L.
Notes: Research was carried out to develop improved protection guidelines for silane handling systems through enhanced understanding of the behavior of releases of this pyrophoric gas. The approach involved addressing three aspects of the problem: the prompt ignition behavior of silane; the reactivity characteristics of quiescent silane/air mixtures; and the rates of reaction of silane leaked into enclosures with and without explosion venting, in the presence of ventilation air flow. A first conclusion, reached from tests in a ventilated cabinet, was that, contrary to prevailing belief, the ventilation flow has no measurable effect on the prompt ignition of the release. From experiments in a 5.1-liter (311-in.3) sphere it was found that silane/air mixtures of concentrations between 1.4 and 4.1% (by volume) are explosive but stable. In this case, piloted ignition tests yielded laminar burning velocities up to 5 m/s (1000 ft/min). Mixtures between 4.5 and 38% (the maximum reached in the tests) were found to be metastable, and would undergo spontaneous ignition after a delay ranging from 15 to 120 seconds, with the shorter values corresponding to higher silane concentrations. Experiments were also performed in a 0.645-m3 (22.8-ft3) vessel both with and without explosion venting, to measure the rates of energy release associated with impulsively-started silane leaks from 1/8 and 1/4-in. (3.2 and 6.4-mm) lines. A method for the prediction of the venting requirements of partial-volume deflagrations (PVD) was evolved into a tool to quantify the pressure rise from ignition of silane leaks in enclosures. These results represent a significant step toward updating existing design recommendations which prescribe ventilation requirements that are based on outdated and, in some instances, misinterpreted data. Murphy, John F. ; Zimmermann, Keith A. Notes: The Brazoria County Petrochemical Council, 13 companies that are working together to enhance relations between industry and the community, united in a joint effort at complying with the EPA's Risk Management Program. One of the significant issues the group had to address was the need to develop meaningful hazard assessment for presentation to the public. The EPA's “Table Look-Up Approach” found in the Offsite Consequence Analysis Guidance document is certainly a good tool; however, the built-in conservatism results in over-estimates of potential hazard areas. Much more meaningful results are shown to be obtained using one of the hazard release models.The value of using a credible scenario with realistic meteorological data is demonstrated through the consistently smaller areas predicted by the PHAST Model for planning purposes. Realistic scenarios/failure modes and realistic model parameters are important so that the risk to the public is not overstated. Proprietary models such as PHAST are invaluable in providing more meaningful consequences for planning purposes. Ho, Ta-Cheng ; Duh, Yih-Shing ; Chen, J. R.
Notes: Case histories of 65 incidents in runaway reactions and emergency relief in Taiwan were analyzed and classified into several categories according to their causes, materials involved, equipment types, reaction types, and ignition sources. The cases in reactors and storage tanks were examined in more detail owing to the higher probability or larger potential hazard in these two types of equipments. The most common consequence of the incidents are explosions, fires, and atmospheric release of toxic chemicals. The most severe case was a thermal explosion from an organic peroxide storage area which caused the death of 33 persons. Popping and direct releasing of process chemicals to the atmosphere from relieving devices cause the greatest environmental concerns to the community close to the plants. Runaway reactions in batch type reactors occur frequently due to various operational mistakes. Heat of reaction is the most frequent ignition source of runaway reactions and emergency relief. Notes: EPA's Risk Management Program regulation, promulgated in June 1996 as 40 CFR Part 68 requires subject industries to submit Risk Management Plans by June 1999. This plan requires hazard assessment of the operations of a facility using worst case scenarios and alternative releases. EPA has provided an Off-site Consequence Analysis (OCA) guidance to help facilities in their hazard assessment.OxyChem will be significantly impacted by the RMP rule. This paper outlines OxyChem's general experience and its strategy in planning to comply with this rule. OxyChem's approach in the development of the scenarios required by the rule is described in this paper. Limitations involved in the use of EPA's look-up tables or a single modeling solution for conducting all of the OCA are discussed. A three tiered OCA approach is presented as a possible alternative. Høiset, S. ; Hjertager, B. H. ; Solberg, T. ; [et al.] Malo, K. A. Notes: Gas explosion simulators are often used as tools in process plant design. This article presents some properties of gas explosions found using the EXSIM simulation software on three offshore modules with a total of nearly 10,000 simulations. The selected results are chosen for their supposed applicability to structural design in the process industries.Generalized data are presented for the effect of gas cloud size, explosion impulse vs. explosion pressure, pressure and impulse vs. duration, the probability of a “short” explosion, loading rate, pressure-time “shape” function, and the effect of introducing louvers. Walter, M. ; Lesicki, R.
Notes: An ammonia storage tank was built at the BASF Antwerp site in 1969 on land reclaimed from the sea. After several years of operation uneven foundation settlement, of up 2, occurred. In order to assure stability of this area for the next operation period (at least 10 years) measures were taken to ensure continued safe operation. One key measure was strain gauge monitoring at the location of maximum stress. Parks, Sean C. ; Schulze, Lawrence J. H.
Notes: Some of the hazards encountered by process plant operators involve the operation of in-line valves to control, start, and to stop flow. Torque required to operate valves may vary according to valve wheel size, in-line pressure, and valve flange position (open/closed). This study determined how valve wheel size, in-line pressure and valve position (open/closed) affect torque required to actuate a valve. Data were gathered with each combination of size, pressure and position for 336 valves in an operating petrochemical process facility. The results indicate that the main effects of valve wheel size, the in-line pressure, and open/closed valve position significantly affect operational torque requirements. In addition, the interaction between position and pressure was significant for operational torque. The implication of these results is that operators are exposed to operational torque requirements that exceed maximum acceptable capabilities that have been determined in previous studies. Ogle, Russell A. ; Schumacher, John L.
Notes: An explosion and flash fire in a fixed bed reactor occurred at a municipal wastewater treatment plant (WWTP). Two employees were injured in the accident. The accident occurred in an ozone treatment building where ozone was used to treat odors from the offgas of the sludge concentration units. Excess ozone manually was routed to the fixed bed reactor (ozone destruct unit) where the ozone is catalytically transformed into oxygen before being discharged to the atmosphere.An investigation of the accident was conducted to determine the root cause of the explosion and flash fire and identify corrective actions which the WWTP management could undertake to prevent a recurrence. This investigation included site inspections, interview with the injured employees, sampling and analysis of various materials, an explosion dynamics analysis, and a root cause analysis.It was concluded that cooling oil from one of the ozone generation units entered the main ozone gas line due to a crack in one of the reactor's dielectric tubes. The cooling oil was vented into the ozone destruct unit when an employee opened a ball valve on the main ozone gas line. The cooling oil, essentially a saturated hydrocarbon mixture, reacted exothermically when it contacted the manganese dioxide catalyst. The exothermic reaction resulted in an explosion which propelled the access panel outwards and dispersed the catalyst pellets. A flash fire followed the explosion. The flash fire burned two employees and caused thermal damage to a nearby control panel.Although this accident was the first of its kind at this facility, this was not the first time that the ozone generator had experienced a failure of a dielectric tube. Thus, there was a significant probability that a dielectric tube failure could leak cooling oil into the main ozone gas line. This failure event could, in turn, result in another explosion and flash fire. The WWTP staff neither designed nor fabricated the ozone generator-destructor system. Therefore, it did not seem appropriate for the WWTP staff to modify the ozone system. Instead, it was recommended that the ozone destruct unit be taken out of service. The WWTP management acted on this recommendation. Notes: A large and potentially hazardous decrease in aldehyde autoignition temperature (AIT) occurs with increased pressure. The AIT-pressure curve determined in a 5 L stainless steel sphere was similar for propionaldehyde and butyraldehyde in air, falling from about 185°C at atmospheric pressure to 90°C at 140 psia. Reduction of oxygen concentration had little effect on propionaldehyde AIT. At 100°C and 140 psia, autoignitions accompanied by at least a doubling of pressure were observed above 4% oxygen. In the presence of a few grams of free liquid, propionaldehyde vapor ignited in air at initial conditions significantly below the AIT. The mechanism appears to involve rapid Fe-catalyzed exothermic liquid-phase oxidation leading to autoignition of the adjacent heated gas layer. An acetaldehyde vapor-air mixture in the presence of free liquid and rust exploded at room temperature when air pressure was increased to 95 psia; this result is discussed with reference to a cylinder overpressurization that occurred while making up an ostensibly sub-LFL calibration mixture with compressed air. Propionaldehyde's limiting oxygen concentration (LOC) was investigated in the near-autoignition region using the same 5L apparatus; the findings are discussed with reference to an overpressurization incident in an air-liquid partial oxidation reactor. The general results are used to illustrate the application of LOC in partial oxidation processes subject to autoignition and to discuss elements of the current ASTM draft test method for LOC, which does not address test difficulties associated with condensable and/or reactive gas systems. Davenport, John A. ; Pabich, Martin J. Notes: This article deals with fire protection for water miscible flammable liquids stored in plastic containers packaged in boxes located on pallets. A series of fire tests was conducted with palletized rack storage arrangements using in-rack sprinkler protection at various levels. The intent of the paper is to present data from this test series for these types of commodities. The paper will identify various existing water miscible flammable liquid products stored in this fashion and provide background information for protecting this type of storage as it relates to NFPA 30 Flammable and Combustible Liquids Code. The test data indicates that further research work is needed in the area of plastic containers for use with the storage of combustible and flammable liquids. Included in the paper are discussions concerning possible protection strategies and suggestions for future research which would benefit those involved in risk management of this type of commodity. Notes: National Advisory Committee's Acute Exposure Guideline Levels (AEGLs) for ammonia are critically evaluated. The technical bases for concern about AEGL-2 and AEGL-3 values derived by the committee are summarized recommendations made. Notes: Risk analysis in chemical process industries is an elaborate exercise involving several steps from preliminary hazard identification to development of credible accident scenarios, to preparation of strategies for prevention or control of damage.All this requires substantial inputs of time and money. In order to get an approximate yet workable assessment of risk at much lesser costs, indices have been developed which link typical findings of elaborate risk analysis to scales of risk. The scales, in turn, provide workable measures of hazards/risks/safety.In the past, indices have been reported for swift risk assessment - the noteworthy among them include Dow fire and explosion index, Mond fire, explosion and toxicity index, IFAL index, and mortality index. A few rapid ranking techniques have also been proposed.This paper presents a new system of methodologies for Hazard Identification and Ranking (HIRA). The system consists of two indices: one for fire and explosion hazards and another for the hazard due to likely release of toxic chemical. The magnitudes of these indices indicate the severity of the likely accident; in terms of the size of the impacted area.HIRA has been applied to a typical chemical process industry - a sulfolane plant - and its performance has been compared with that of the Dow's and the Mond's indices. The study reveals that HIRA is more sensitive and accurate than the other indices. Notes: Dust explosions have been with us for a long time. The first record of a dust explosion occurred in Turin, Italy, on December 14, 1785 . The detailed record of this event is left to us by Count Morozzo. The event took place in Mr. Giacomelli's bakery. We know from his account that the weather was unseasonably dry, that a boy who worked in the bakery was using a shovel to stir and transfer the flour to a chute from a store room to the bakery and he had a lighted lamp to work by. The rest, as the saying goes, is history. No one was killed, and the building was saved by the sagacious fact of having plenty of windows. Since that first record, of course, there have been many explosions with much loss of life and significant economic consequences. Notes: The RSST DIERS vent sizing methodology is revised to provide realistic design equations for reactive systems consistent with available large-scale experience. Using easy to obtain RSST data such as rate of temperature rise and rate of pressure rise excellent agreement is illustrated for hybrid, vapor and gassy reactive systems. Notes: An explosion occurred in a petroleum product storage tank at a refinery. The liquid petroleum product was a heavy oil used as an asphalt extender. There were no injuries, but the cleanup was costly. The storage tank was one of several which received the product stream from a dehydration unit. The accident occurred shortly after the refinery was brought back on-line following a shutdown for schduled maintenance.This was the first incident of this kind to occur at this facility. Analysis of the process data and eyewitness observations indicated that the dehydration tower, which was supposed to be maintained at a minimum of 100°C during the shutdown, was allowed to drift below 100°C for an unknown period of time. This deviation enabled liquid water to enter the storage tank. Three operational factors contributed to the accident. Corrective actions were recommended to prevent a recurrence of a similar incident. Mashuga, Chad V. ; Crowl, Daniel A. Notes: The safest method to prevent fires and explosions of flammable mixtures in the first place. This method requires detailed knowledge of the flammability region as a function of the fuel, oxygen, and nitrogen concentrations. A triangular flammability diagram is the most useful tool to display the flammability region, and to determine if a flammable mixture is present during plant operations.This paper describes how to draw and use a flammability diagram. A procedure to estimate the flammability region using the available and sometimes limited data is discussed. The paper also shows how to use the flammability diagram with plant operations involving inerting and purging, and from bringing vessels into and out of service. A compilation of flammability diagrams for 30 materials, based on previously published data is provided.An automated apparatus for acquiring data for a flammability diagram is described. The apparatus consists of a 20-L sphere with an automated gas mixing system, a fuse-wire ignition system, and a high speed pressure measurement and data acquisition system. Data derived from the apparatus includes flammability limits, maximum pressure during combustion, and the maximum pressure rate. The effect of fuse-wire ignitor dynamics on the results is studied. A flammability diagram for methane drawn from data obtained from the apparatus, is presented. Notes: Effects of elongation on the radiation heat transport down a spheroidal cavity, located in a conducting solid with a diffusely reflecting cavity-solid interface, are examined. An effective conductivity λe and a void radiation conductivity λr are obtained as a function of cavity eccentricity α; and surface emissivity ε. To facilitate the calculations and produce readily applicable equations, a rigorous variational principle is used. Exact solutions are generated in the neighborhood of the spherical cavity (α2 → 0) for any ε > 0, a long needle-shaped void (α2 → 1) for any ε > 0, and a perfect reflector (ε → 0) for arbitrary elongation (0 ≤α2 ≤ 1). Significant differences arising from the shape change are observed. The α2 → 0 edge demonstrates a linear increase in λr with ε. At the opposite edge α2 → 1 and positive ε, λr is a horizontal line independent of ε, much like the long cylinder, whose conductivity is a factor of 32/(9π) (= 1.13) larger. In the neighborhood of ε 0, λr is always zero for any 0 ≤ α2 ≤ 1. The emissivity slope for ε → 0 starts from unity at α2 = 0 and increases monotonically with elongation to a singularity 3π[16(1 - α2)]-1 as α2 → 1 for the long needle. Jiang, Yan ; McAuley, Kim B. ; Hsu, James C. C.
Notes: In most industrial gas-phase polyethylene reactors, heat is removed by cooling the recycle gas stream in an external heat exchanger, where a portion of the vapor is condensed. The condensate evaporates in the reactor to absorb heat released by polymerization reactions, thereby increasing the production capacity of the unit. Nonequilibrium methods of multicomponent condensation are applied to develop a 1-D model to simulate the cooling unit of an industrial polyethylene reactor system operated in partial condensing mode. Finite difference approximations are used to convert the resulting set of differential equations to algebraic equations. A practical method of solving the equations is to combine the rapid local convergence of Newton's method with a globally convergent strategy. Correlation methods for estimating local heat-transfer coefficients in the liquid film layer are discussed. Butterworth's method for shear-stress-controlled condensate flow gives reasonable agreement between simulation results and industrial data, while Chen et al. 's method can better describe the transition process of condensate flow from laminar to turbulent flow. Kong, Donna D. ; Kosar, T. Fettah ; Dungan, Stephanie R. ; [et al.] Phillips, Ronald J. Notes: Diffusion coefficients measured by holographic interferometry are presented for two globular proteins and three nonionic surfactant species in agarose gels. The cloud points for the surfactants in agarose solutions are also given. In all cases, rates of diffusion in the gel are smaller than those in bulk solution, with the hindering effect of the gel increasing both with increasing gel concentration and with increasing solute size. It is shown that the diffusion rate of the surfactant micelles is very similar to that of proteins having similar hydrodynamic radii; it would therefore appear that the size and shape of the micelles in the solution and gel phases are similar. In addition, the measured rates of hindered diffusion agree very well with rates predicted by a rigorous hydrodynamic theory in which the solutes are modeled as hard spheres and the gel fibers are modeled as straight, cylindrical fibers. Hence, for the range of conditions considered, rates of hindered diffusion for both the globular proteins and the micellar species are determined primarily by hard-sphere hydrodynamic and steric interactions between the solute and the gel matrix. Tien, Chi ; Bai, Renbi ; Ramarao, B. V.
Notes: Equations were derived that describe the dynamics of cake growth in cake filtration, and methods for their solutions were developed. In deriving the equations, the moving boundary nature of the cake formation process and the effect of fine particle retention were considered. It was shown that fine particle retention may contribute significantly to the decrease of cake permeability and thus alters the performance of cake filtration even if the amount of fine particles involved is small. Through numerical examples, it was also demonstrated that fine particle retention in filter cakes may cause serious errors in determining the constitutive relationships from filter test data. Notes: Fundamental characteristics of liquid-solid fluidization at high pressures (up to 21 MPa) and moderate temperatures (up to 89°C) are investigated. Properties under study include minimum fluidization velocity (umf), bed voidage at minimum fluidization, and bed expansion. Devices for in-situ measurements of physical properties of the liquid in the bed are developed, and measurements are carried out to quantify the pressure and temperature effects on the fluidization behavior. The results indicate that under high pressures and moderate temperatures, liquid-solid fluidization behavior is affected significantly by the variation of liquid density and viscosity with pressure. As the pressure increases, the liquid viscosity and density increase, yielding an increased drag force and buoyancy force on the particles, and hence a decreasing umf and an increasing bed expansion for a given liquid flow rate. An increase in temperature has an opposite effect on the physical properties of the liquid, increasing umf and decreasing the bed expansion for a given liquid flow rate. Various correlations proposed in the literature for umf and bed expansion, including those by Richardson and Zaki (1954) and Chitester et al. (1984), are applicable to high-pressure and high-temperature conditions when proper account is made of the liquid physical properties under bed operating conditions. Rinker, Edward B. ; Hanna, Owen T. ; Sandall, Orville C.
Notes: Asymptotic power series solutions for the mass-transfer enhancement factor for absorption of a gas component into a liquid where it undergoes irreversible instantaneous chemical reaction(s) with one and two liquid-phase reactants are developed in this work. The Padé technique is used to extend the region of applicability (accelerate the convergence) of the four-term asymptotic power series solutions. The resulting modified asymptotic expressions for the enhancement factor show excellent accuracy over a wide range and can be used to predict enhancement factors as low as 2 with an error of about 5% compared to the exact numerical solution. Predictions of these new asymptotic solutions are compared with experimental absorption data for H2S absorption into aqueous methyldiethanolamine and H2S absorption into aqueous mixtures of methyldiethanolamine and diethanolamine obtained in a laminar-jet absorber. The absolute mean deviations of the predictions from the experimental absorption data for the single and mixed amine solutions were 4.6% and 2.4%, respectively. Notes: In many instances of practical interest, countercurrent adsorption separations operate on feed streams containing not only the components to be separated but also some desorbent. Criteria for the optimal and robust design and operation of these units are developed by extending previous treatments developed for desorbent-free feedstreams. The effect of the presence of some desorbent (weak, intermediate, or strong) on the location and robustness of the region of complete separation in the operating parameter space is discussed.